THQ isn't planning to abandon its Online Pass scheme anytime soon, but it wants to make sure that gamers don't feel cheated when they shell out their ten bucks. THQ's Online Pass is a simple arrangement: If you want to play online you either buy a new copy of the game or cough up a small fee. But it's those who are paying the fee that THQ's Danny Bilson is most concerned with right now, because he wants to give gamers something for their ten dollars, so they don't feel like they're being "punished" for not going for the full price option. Bilson said that THQ wanted to make "great game[s] that people wanted to play," but pre-owned sales made it harder to fund them, as none of the money went back to the developer. He said that the Online Pass was a way of still generating revenue from used sales, but he also wanted to make that ten-dollar expenditure seem worth it. He said that as well as unlocking online play, the Pass would also activate some content. 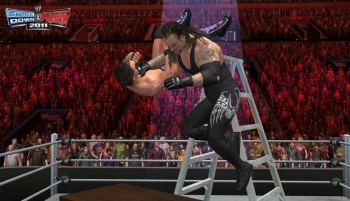 He used THQ's next WWE game as an example, saying that in exchange for their cash, players would unlock the first DLC pack, which included additional playable characters. He said that THQ was trying hard to make it seem like a positive experience. "It's simple and difficult," he said. "We don't want to punish our consumers ... So we're trying to figure out how to give those used guys something for their money, not just unlock the lockout ... I'm trying to make it work for everybody, so we have a happy consumer base whether they're buying used or new." This revised Online Pass is starting to sound a lot like EA's Project Ten Dollar, especially the setup for Mass Effect 2 or Dragon Age: Origin, where the content offered for buying new was quite significant. Some people will still rail against this, as the idea of day one DLC is still a new one, but THQ is at least trying to make it as reasonable as possible.